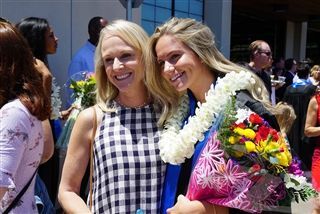 The 95 members of the Class of 2018, along with many family members and friends, enjoyed a joyful commencement ceremony on June 14. 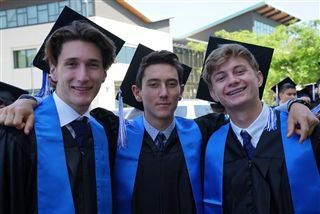 After an introduction by Upper School Co-Heads Allegra Molineaux and Tim Betzala, Senior Class President Katja Reich and Student Body Vice President Jordan Lee gave moving speeches about unforgettable experiences they had with their classmates and the unwavering support they've enjoyed over the course of their high school careers. All-School President Vivian Yun spoke about the unique bond she shared with her classmates and the importance of living each day to the fullest. Then, Head of School Dr. Bob Ogle discussed how focused attention, or deep work, trains young minds for a purposeful life. He urged the class of 2018 to read for fun and to focus on what matters, living a life of substance. A heartfelt and amusing video message from faculty and a musical performance of I Livedpreceded the presentation of diplomas and reading of the class's senior statement. The ceremony concluded with remarks from 12th-Grade Dean Elizabeth Grossman and the graduation chorus, including alumni and faculty, performing Irish Blessing, and the traditional tossing of mortarboards. Congratulations, graduates!